Those rains just won't give Willie a break! Tonight's screening has been postponed. Buena Park Neighbors says, "The showing of Willy Wonka and the Chocolate Factory is cancelled for tonight due to the weather. 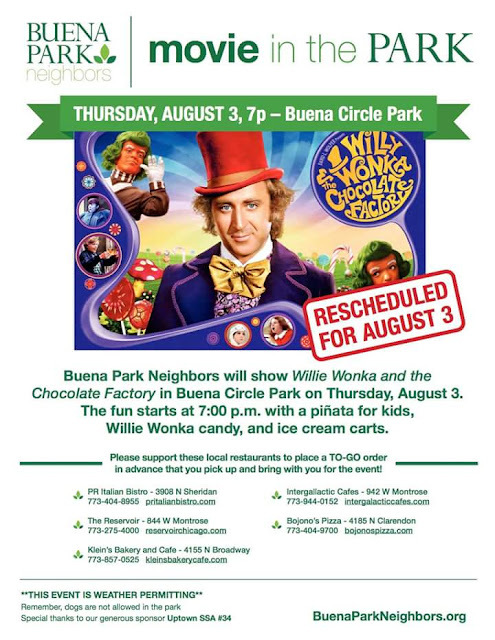 So, please mark your calendars for Thurs., Sept. 7, 7:00 p.m. for the rescheduled showing of Willy Wonka and the Chocolate Factory. The movie will begin at dusk. Maybe three times will be the lucky charm!"